Black lipstick. I begin the series with this look because it was the first color I was told, personally, that I could never be able to pull off. Truth be told, black lipstick can either look ultra depressing and drab on our dark skin tones, or sexily Gothic and edgy. We’re aiming for the latter. 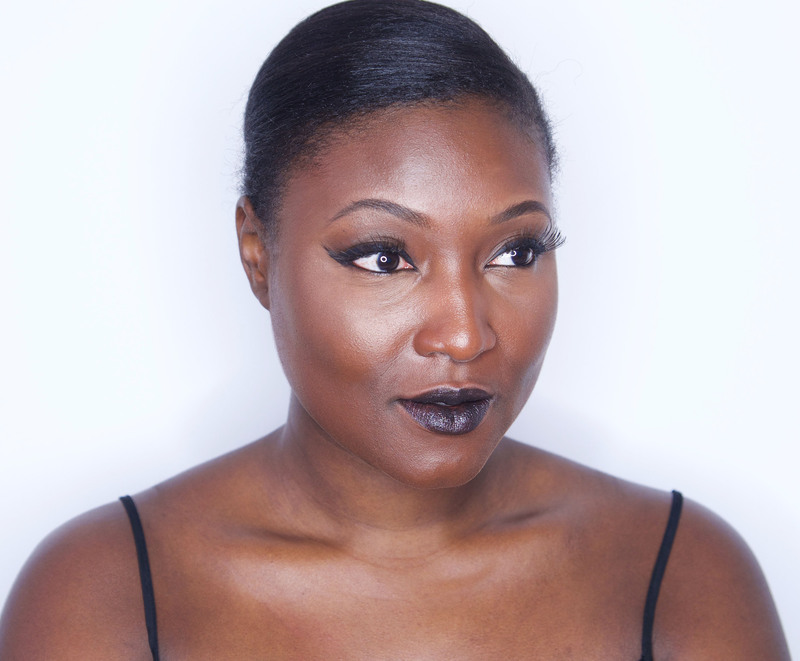 Black lipstick on dark skin is tricky, but not impossible. You want to make sure, when wearing this color, that your lips are exfoliated and hydrated, your foundation and concealer are perfect and your makeup is as simple as possible. I’m rocking Hard Candy’s Fierce Effects Lipstick in Black Diamond. What I love most about it is that it’s not drying and it has very small glitter specs that offer a nice sheen without being over the top. By creating an even toned, somewhat matte face with the YSL Le Teint Touche Eclat Illuminating foundation and Make Up For Ever’s Pro Finish powder in 185. I also baked with NAR’s Radiant Creamy Concealer in Amande and MAC’s Prep + Prime CC powder in Adjust. The goal is to make sure your foundation and concealer look perfect. Black lipstick needs an amazing, fabulous palette. Finally, I added a cat eye, false lash and a super light sweep (seriously, do not over-do it on the blush) of MAC’s Powder Blush in Ambering Rose. *Be sure to hydrate your lips, this one is a tad drying. How do I find out what my undertone is? For us, it can be tricky. If you can see your veins, try to pay attention to their color. Can you tell if they’re green or blue? If green, you have a warm undertone. If blue, you have a cool undertone. Also, look at yourself in natural lighting. Do you naturally feel like you have a yellow, gold or olive hint to your skin, you have a warm undertone. If you see more of a pink or red undertone in your skin, you more than likely have a cool undertone. Another great thing to do is to go to a professional makeup counter and ask someone. I’d suggest NARS, MAC or Bobbi Brown. You don’t have to buy anything. Just ask them what they think. I hope this helps. Feel free to email me at anytime!